How Do I Communicate my Feedback Effectively? How Do I Choose My Pitch Deck Designers? Here at Pitch Deck Fire we specialize in designing the best custom pitch decks for our clients. Throughout the years, our clients have given us tons of feedback. Feedback has come in many different forms and styles and although we’ve perfected our in-house feedback mechanisms, we wanted to help guide you through working with your pitch deck design team to get the best results. As professional pitch deck designers, we are uniquely qualified to answer this question and help you get the most out your project. If you are already working with us, you can use this guide to streamline feedback and know what to look out for. As mentioned, we receive a lot of different kinds of feedback from our clients when we’re going through a Pitch Deck. One thing I would say before we even start talking about how to effectively give good feedback to your pitch deck designer is to think about how your pitch deck designer works with you. Ultimately that relationship will affect how the feedback needs to be given. For example, here at Pitch Deck Fire we work iteratively with our clients. Meaning we put together an iteration of the project and then get feedback. We show the pitch deck to our clients for their feedback at various stages during their project and we incorporate that feedback until the design and content are both perfected. What we don’t do is complete the entire design and content development and then hand it to our clients for their feedback at the end. Iterative design is important for timing and getting expectations clear over the course of the entire project. In this type of progressive relationship feedback is welcome and sometimes major changes to content and design are made to pivot to initial reactions. If you don’t have this type of relationship with your design team, your feedback will be less valuable and getting what you are expecting in the end is extremely unlikely. Most of the work coming our way from design teams like this has left our clients behind on their commitments with a substandard product that they need us to fix for them right away. When you’re working iteratively with your designer (and we hope you are), you want to make sure that you are giving really high quality feedback at every stage in the process. You don’t want to just wait until the end, or wait until you’re less busy. You also want to make it a point to choose pitch deck designers that work iteratively. Going with templated project designs or designers who don’t specialize in pitch decks gives you a natural weakness in that your feedback will not be as easily incorporated and you won’t receive the expert guidance and perspective that comes from working with a dedicated pitch deck design firm like ours. Feedback throughout the design process allows the designer to capture what’s in your head. Even seemingly insignificant comments can make your deck just a little bit more of a better fit, or tell your story just a little bit more. Having this “extra” clarity is extremely important in aligning your story and presentation with the pitch deck’s storytelling, flow, and design. It might sound like a lot to give thorough feedback more than once, but it actually reduces time overall and gives a better quality and more accurate result in the end. Every time your feedback or revisions go back to the designer it takes time to understand and incorporate them. Your project is going to take longer if you don’t give your designer thorough feedback. Especially in the beginning of the project. With little direction or understanding of want you want to accomplish, you risk having a product coming back to you in a way that you didn’t expect. Sometimes design disparity happens even when you do give great feedback. But never despair. Design that has your full perspective behind it from the beginning is easy to change. Most often issues with not getting what you want stem from interpretation disparity. With feedback and course correction, it will not require an entire overhaul of every element of the pitch deck. Design is an art after all. And, designers do not hit the mark on the first try every time. Your design team should have a way for you to give robust feedback. This is not email based or verbal. Those mediums are a breeding ground for miscommunication. You need to be commenting on each and every slide and preferably on each piece of content that needs feedback. You design team should be providing you with this robust feedback mechanism. If they don’t, Beware. It’s something you can ask about up front when deciding on pitch deck designers for you company. Systems that allow each element of the deck to be commented on is the best way for your designers to request feedback and it is the only way we request feedback from our clients. Feedback on a specific selection of content (like a picture or a section of text) means you’re able to give thorough and detailed feedback on every single element of the pitch deck. With these types of systems in place, the risk of missing something or not being on the same page with your designer is greatly diminished. You can communicate better, eliminate confusion, and save tons of time because you don’t have to explain things like, “On slide two, the second section at the bottom on the right I want this word to be the other word.” Instead you just highlight the section and write in the feedback. That makes it seamless and easy and everyone has all the notes in one place for future reference. Not only that but these tools allow multiple team members to input feedback at a time, even replying to each other on comments. So you can say good-bye to collecting multiple people’s feedback and collating it into a single document. If you’re not given an opportunity for robust feedback it’s going to be a little bit harder for you to provide the feedback in an effective, traceable way. We recommend choosing other providers that have these systems in place. This is especially true for pitch deck due to their complexity and how many different levels of a deck could be potentially editable to better serve your purpose. Choosing to go this route, you will quickly find yourself on a confusing project, not getting what you want. If you proceed with design teams that are not setup to manage the complexity of a pitch deck appropriately you are putting your sanity and business at risk unnecessarily. And your company’s future is in their hands until you decide to look for a rescue pitch deck provider. We don’t want that to happen to you and we would prefer you get it right from the beginning so you can focus on your growth. First of all you want to look at what has been created for you from a standpoint of the aesthetics themselves,. How does that look? Does it fit your brand? Are the colors working,? Is it clear what you’re supposed to look at first on the slide versus next on the slide?? Do you like the picture that’s used? Those are the kinds of things from an aesthetic standpoint that you want to give feedback on when you receive your deck and iteration of your deck. Another thing you want to give feedback on is the content itself. Imagine a particular slide, if there’s a sentence, half sentence, a bullet point, or there’s a piece of information that’s written out in text, you want to read that and see if it really resonates with you, and if it does tell your story in the right way. Does it belong on another slide? How would you reword it? Is it right? Is it in your voice? Feel free to ask questions of your designer and say, “I’m not sure. This is what I’m thinking here. But up to you if you want to do it this way or another way. Refer to your expertise” That’s totally fine. We see this a lot. But it’s always very valuable to hear what input and feedback you do have because you are closest to your company. And you are closest to how your message should be. And we want to make sure we fit within that, and expand upon it making it the best that it can be. And so you want to make sure you give your feedback appropriately from an aesthetic standpoint, but also from a content standpoint. Then after you’ve given feedback throughout the deck on the aesthetics and the content on each slide, I want you to zoom back one level and look at everything that’s been provided and think through the flow of it. And ask yourself, “Does this flow with the way that I like to think about or talk about in my company?” Does anything feel out or place? Orphaned or alone? Imagine you knew nothing about your company, can you understand it reading through this pitch deck? As pitch deck designers, we really want to make sure that not only are we creating something that is visually appealing and tells your story, and that is covering the things that it really needs to cover. But we really, really want to make sure that it feels good and is effective for you during your actual pitch. If you have taken the time to build out your pitch script, the pitch flow can be better evaluated. If you haven’t and you want some help, check out our article here on developing your pitch script. Nothing is going to be more effective than something that fits with your voice. If you’re not comfortable in that tone, if you’re not feeling that storyline, it might be the best storyline in the world but it needs to fit with how you think about your company and how you like to talk about your company. Not all feedback is created equal. Never give it a really high level, like, “I don’t like this. I don’t like that.” That is not going to be valuable on it’s own. Give very specific feedback. If you want to change a sentence to a different sentence, tell us the new sentence that you want to change it to. If you don’t like a color, suggest a new color. But know that you can tell your designer, “I don’t know what color it should be, but I don’t like red because red feels too aggressive.” Give us that extra bit of information. the “because it feels too aggressive” Otherwise a simple “I don’t like this” could be interpreted in so many different ways. Hopefully there’s not a lot of things that you about your deck. But if there’s any piece of the deck, or a part of the slide, or a sentence, or something that doesn’t fit right and doesn’t feel right to you, try to explain why it doesn’t feel right or how it doesn’t feel right. So that your designer can have a little bit more information to figure out how to make it better. I know you may not know “it’s red, but I want it to be blue.” But at least try to tell your designer why red doesn’t work so they can figure out a way to solve that problem for you. Without the extra little bit of information it might take more times, more iterations, and more tries before your designer gets it right. The more specific you can be in those comments the better. As a recap, give your designer feedback on the aesthetics, the way that it looks, the content itself, the words chosen, making sure those resonate with you. And then take that step back and take a look at it from a standpoint of the whole story line and flow of the deck to make sure that fits what you want and how you think. Make sure you do this with as much detail and clarity as you can. There you have it, that’s how to give good feedback to your pitch deck designer. If you have any thoughts on ways to give good feedback to your pitch deck designers we’d love to hear about it in the comments below.  And if you have any ideas for upcoming pitch hacks, there’s a link below as well to submit that. We’d love to hear your ideas for upcoming topics that you need to learn more about to make your most successful investor pitch and pitch deck.